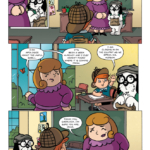 Home » .News » New this week: KID SHERLOCK from @ActionLab, a must buy! 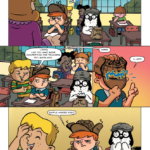 New this week: KID SHERLOCK from @ActionLab, a must buy! AMBER LOVE 13-JUNE-2017 The FARRAH WETHERS MYSTERIES are available through sites like Amazon and Barnes & Noble. Please go to patreon.com/amberunmasked to sponsor the show, the site, and my work. 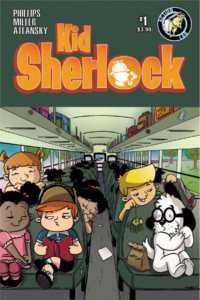 I couldn’t wait for KID SHERLOCK #1 to come out after seeing the cover and publisher description. Watson is a dog; Sherlock is an outcast nerd; Ms. Hudson is their teacher; and Mr. Lestrade is their principal at Baker Elementary School. Watson is a new student and bullied immediately. Fortunately, Sherlock’s quirks and penchant for observation, experiments, and also being bullied lead the way to them becoming fast friends. 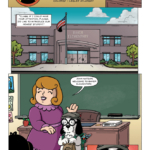 Watson comes onto the scene in the midst of an investigation about a funky smell that’s not present in the school all the time so the staff hasn’t been able to solve the problem. Of course, Sherlock does and gets a little revenge in the process. I hope more female and minority characters are added soon. 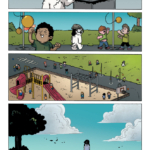 KID SHERLOCK #1 is everything you want an all-ages comic. After the colorful pages and easy-to-follow lettering, there are bonuses. There’s a cute one-page story of the duo; then there are puzzles. Perhaps the coolest part of the back matter is the How To Draw Sherlock and Watson pages with steps on how making a comic comes together from sketching to inking and colors to the final pieces. Included at the end is fan art which I hope to see plenty of in upcoming issues. 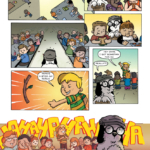 Comments Off on New this week: KID SHERLOCK from @ActionLab, a must buy! VALIANT HIGH #2 – Valiant’s All-Ages Adventure Skips Second Period with Daniel Kibblesmith & Derek Charm in June!